“Finding Hope After a Stroke: 4 Success Stories From Communication Device Users” is a collection of four AAC device users’ stories. 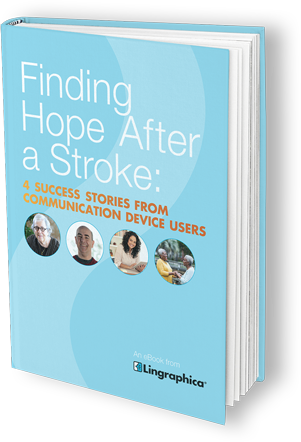 Our eBook details how a Lingraphica communication device opened the door for independent communication for several stroke survivors. You’ll also hear from a caregiver and a speech-language pathologist! Download today and see how a Lingraphica communication device can help you.